For some reasons, there is still some controversy surrounding older kids in strollers. Maybe that’s because some people simply don’t understand that children develop at their own pace. Some kids get tired quicker than others, and it’s much easier to put them in a stroller after a long walk than to carry them all the way home. Maybe your kid has a medical condition or they are recovering from an illness – whatever the reason is behind your need for a large stroller, I’ve got you covered. In this review, we’ll check out the best strollers for big kids, which have capacities up to 75 lbs! If you’re not sure yourself what type of stroller you want for your kid, here are some things that you should pay attention to when choosing the right one. If you’re a mom of an older kid, then I guess you know the difference between an umbrella and a jogger stroller. And you can skip this part; this is mostly for people who aren’t aware of the difference – maybe you want to surprise your friend or a family member. 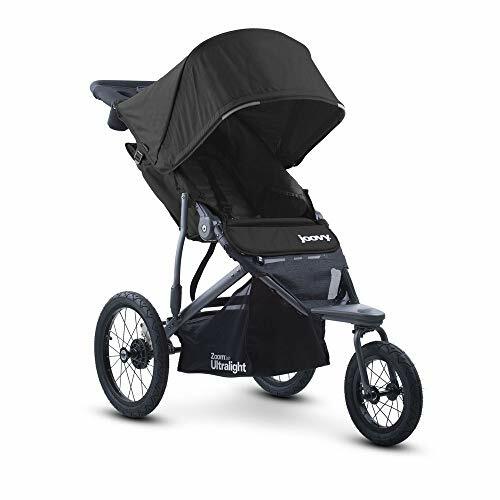 A jogger stroller is large, bulky and usually has much more features and storage space than an umbrella stroller does. It is the best choice for everyday walks and it allows parents to put all the additional things they need for their kid in the stroller basket. An umbrella stroller, on the other hand, folds just like an umbrella. Therefore, it is much more compact, and it is the better choice for travel. Some companies even make strollers that can fold to fit inside your purse, which makes them perfect choice for flying with your kids! Now this depends on the preference of the parents – maybe they prefer joggers, and they would want to continue using one as their kid gets older. Or maybe they would like to switch things up; in any case, it’s something that you should either think about (if you’re shopping for yourself), or ask mom and dad (if you’re shopping for someone else). But keep in mind that there is usually no difference size-wise – you can get both a jogger and an umbrella stroller for bigger kids. I’m guessing you already know that there’s a huge difference between strollers for newborns and strollers for older kids. Mainly because strollers for big kids don’t offer the same type of head support that strollers for babies do. My point being that, unfortunately you can’t buy your newborn a stroller that they will be able to use for years. But you can get your two-year old a stroller that will last them until they are five or six. Make sure you check out the maximum weight capacity of each stroller, and try to figure out how long it could last your kid. How much weight do they gain in a year, on average? If you think that they will outgrow a 45-lb stroller, then go for a 55-lb or a 65-lb one, just to be safe. There’s not much difference design-wise, and you will save yourself $$ if you go for one that they will be able to use longer. If you are looking for strollers for twins, or just two kids, then this post on double strollers is the one you want to read. Maybe your kid would love to walk all the time but they have a medical condition that prevents them from doing that. Or maybe you’re just not happy with the fact that you have a 5-year old and they still want to be wheeled around in a stroller. That is also okay – it is not easy being a parent, and sometimes it’s hard to deal with what your kid needs vs. what they want. There is a way that you can both get what you want – with a fun and interactive stroller. I will show you a couple of these; mostly they are strollers with pedals and bike-wheels that your child can manoeuvre themselves. So, they still get the comfort and safety of a stroller, but they are learning something new and getting some physical activity at the same time! And if they eventually get too tired to pedal the stroller, you can always push them the rest of the way. Note: If you are looking for something more portable for travel, this check out this post for a great travel stroller. 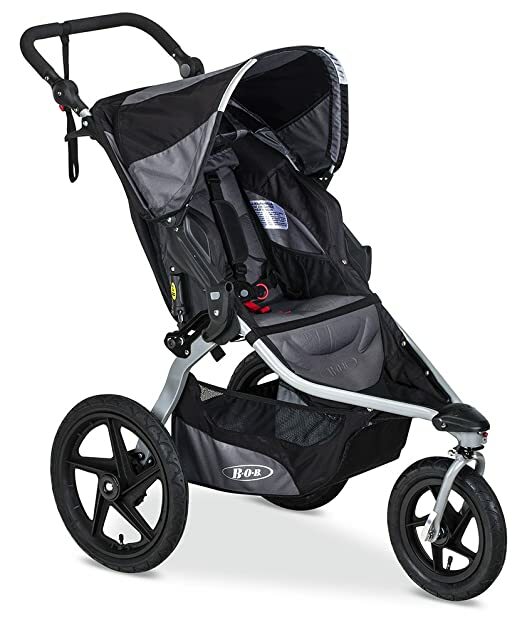 The Zoom 360 is one of the best strollers for big kids you’ll find. For one thing, it has a maximum weight capacity of 75 lbs, so you know your kid will be able to use it for a few years. And the stroller is recommended for kids that are at least three months old, so you could technically get several years of use out of it. The seat of the stroller reclines and it can be adjusted to several different height positions. The seat itself is about 20” tall (from the bottom of the seat to the canopy), so it will probably be tall enough for your child. Generally, kids that are up to 45-47” will be comfortable in this stroller, unless they have a pretty tall torso. Because if your kid has a tall torso, there’s a good chance that their head is going to touch the canopy, and that’s not really entertaining for anyone. Moms from all over the world have reported using this with children that range in age from 2 to 6 years old, so there’s a good chance that you will be able to use it with your kid. And when you do you will have plenty of space for your own things, with the mesh pockets and the parent organizer that’s included in the stroller. Plus, it’s really easy to manoeuvre this thing around – the front wheel swivels for maximum maneuverability, but it can also be locked into position. And with shock absorbent suspension, you can even use the Zoom 360 on cobblestone, and not worry about your kid being bothered by the bumps! The Caboose stroller is a good example of a stroller that you can use for years with a kid. It’s even suitable for babies, provided you put them in a car seat first. But with a capacity of 45 lbs, it’s also great for older kids. This is a tandem stroller, so it’s also suitable to be used by two kids at the same time. And I personally think that it is an awesome all-in-one choice. According to Joovy, the front seat of the Caboose is suitable for kids that are up to 40” tall, while the rear sit can be used by kids that are up to 44” tall. I can’t tell you the exact age that the stroller is recommended for, because that mostly depends on how tall your kid is, and how quickly they grow. Oh, and the rear of this stroller features both a seat and a standing spot for your kid, so they can choose what they’d like to do that day. In terms of comfort and safety of your kid, the stroller has a 3-point reclining seat, in addition to a parking brake. Plus there is a pretty big basket below the reclining seat, as well as a few slip pockets for all of the other things you’ll need on the go. Overall, this is probably the smallest and most compact stroller you can get for two kids! You know how I said at the beginning that you can even get a stroller that will fit inside your purse when folded? Well that’s this one! The Pockit is one of the most lightweight and compact umbrella strollers ever, and it is perfect for parents that are looking for something that’s travel friendly. It’s not as sturdy or shock absorbent as your jogger stroller, but it’s more than good enough for a family vacation. It’s great for kids that are up to 55 lbs, but it’s not really suitable for babies, because it doesn’t offer head support that they need. The seat of the stroller is pretty tall (about 21”), and so it’s great even for taller kids. Children that are up to 45-46” tall will definitely be comfortable in this stroller. I’d say that the only downside of the Pockit is the pretty much non-existent canopy, but that’s something that you could always buy separately. 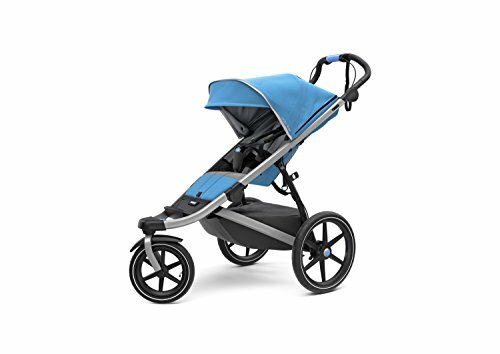 Other features of this stroller include an adjustable harness, swivel wheels that you can also lock when you want to, and a large basket below the seat that can hold up to 11 lbs of gear. And I haven’t told you the best thing about the stroller – it weighs just under 10 lbs. Overall, if you are looking for a lightweight and travel-friendly stroller for your kids, I think this is the best one your money can buy. BOB is a brand favored by moms from all over the world. 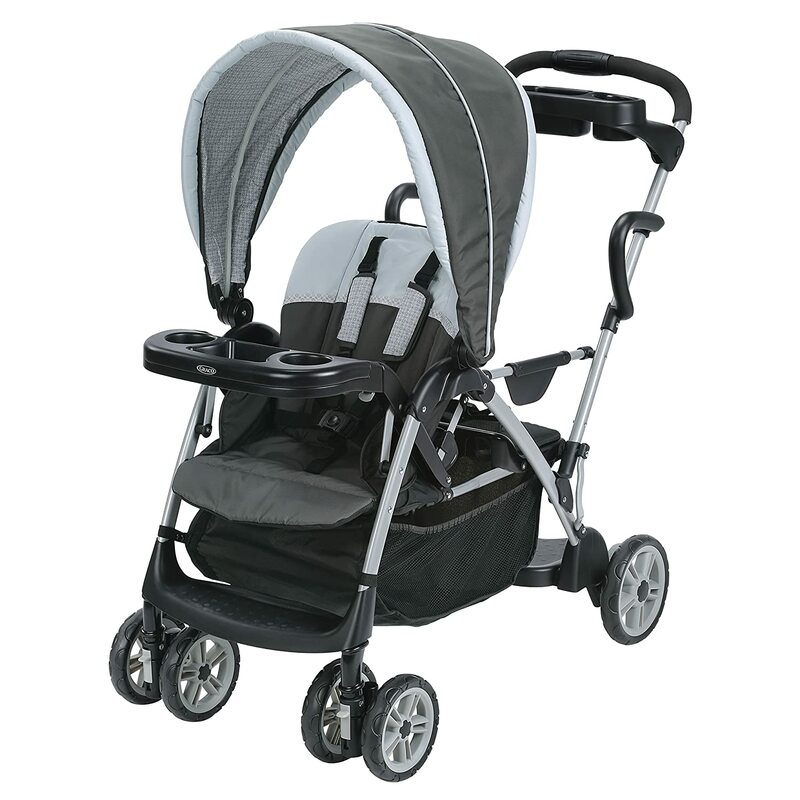 They make top-of the line strollers that are easy to use and highly reliable. But that comes at a price, which is usually pretty high. And more than worth it, because this one of the few strollers that has a capacity of 75 lbs, in addition to all of its other features. Those include locking swivel front wheels that have excellent shock absorption and perform great on all terrains. There is also the padded and adjustable handle bar, which is really useful if there’s a big height difference between you and your spouse. This way you can both adjust the handlebar to fit you how you need. 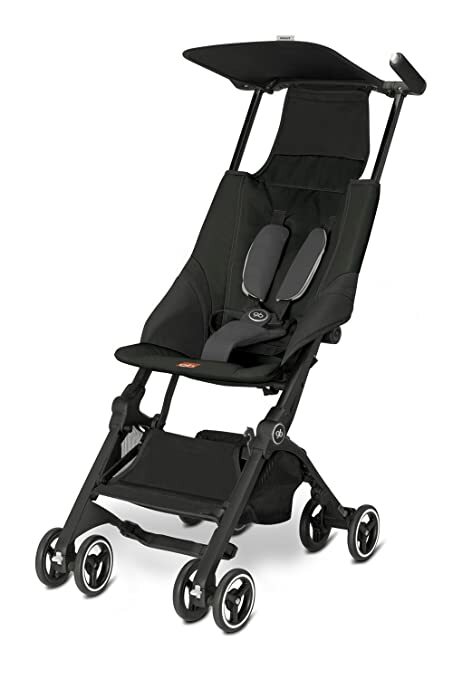 And it also has an excellent suspension system, so that your child doesn’t feel a single bump in the road. In terms of gear storage, you get a large basket below the seat and quite a few pockets on the back. The only thing you might miss is a cup holder, but you can purchase that separately. I would actually recommend you do so (get the stroller bundle for $20 more), because you will also get a tire pump. Which is not included in the purchase of just the stroller. But overall, I would definitely recommend this stroller if you can afford it. It is very reliable and it performs excellently on all types of terrain. If you’re looking for a fun and interactive stroller, I can’t recommend this one enough. For one thing, it’s can be used by kids that are at least 9 months old, up to 5 years. And it grows with them – the seat is adjustable and the parts are removable. So, as your child grows older, you can remove the canopy and the safety handles in the front. That way, they can really feel more independent. Keep in mind that this is not your everyday jogger stroller – this is more of a stroller for fun outings with your kid, who doesn’t really want to be wheeled around in a big-boy stroller all the time. But still gets tired after long walks. And one downside of this is that they removed the footrest from the newer models, so it’s much less suitable for younger kids. Older kids, on the other hand, can usually rest their feet on the pedals. As your kid grows, you can even remove the parent steering handle, so that they can feel even more grown up. But if you’re getting this for your two-year-old and plan to use it with them even when they are older, you should know that there are plenty of features for them. There’s the three-point harness, as well as the adjustable seat and canopy, and a removable front tray and cup holder. Overall it is a pretty fun version of a stroller, but definitely not something you’ll want to use every single day. The Kolcraft is a good choice because it is basically an umbrella stroller, but it is nowhere near as small as umbrella strollers traditionally are. So, if you are looking for something lightweight that’s also compact to store, this is a good choice. The maximum capacity of this stroller is some 50 lbs, which could even fit an average 6-year-old. There are no exact specs on the height of the back of the seat, but a few moms did state that their 41” tall kids fit comfortably in it. And the seat of the stroller reclines, so you will be able to adjust it to an angle that will fit your kid best. However, some parents had issues with the angle of the seat because it leans a little bit forward – apparently, there’s a chance that a smaller kid will just slide out from it. But that should not be a problem with older kids. In terms of convenience for parents, the stroller has a large basket under the seat that can hold all your on-the-go necessities. There are also trays for both the kid and the parents, with the latter one including two cup holders. But there are also some inconveniences, like the fact that you will actually have to bend down to lock the rear wheels of the stroller, when you should be able to do this with your foot. And the height of the handle is not adjustable, so there’s no guarantee it will fit you properly. The Thule jogger is another popular choice for older kids. And for good reasons – with a seat back height of 21” and a capacity of 75 lbs, it’s great even for older kids who are taller or heavier than average. 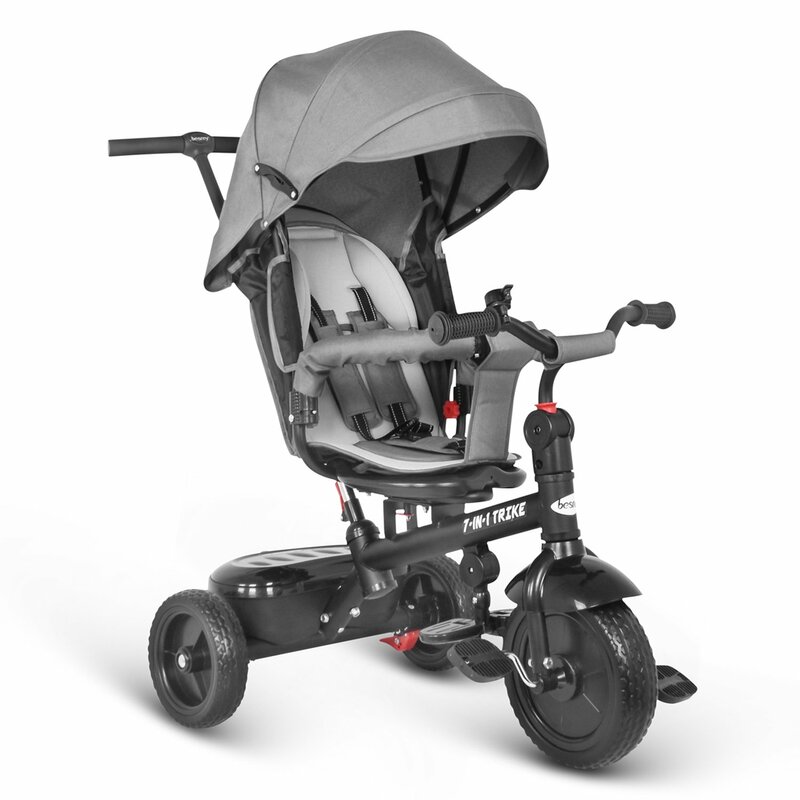 Plus, it is a very safe and sturdy stroller, with a lot of really useful and thoughtful features, like the integrated hand brake and the locking swivel wheels. The main downside of this stroller is that locking of the brake is not as easy as it should be, since the brake is a little stiff. And Thule justified this with a brake-in period for the brake, which is kind of weird but also true. 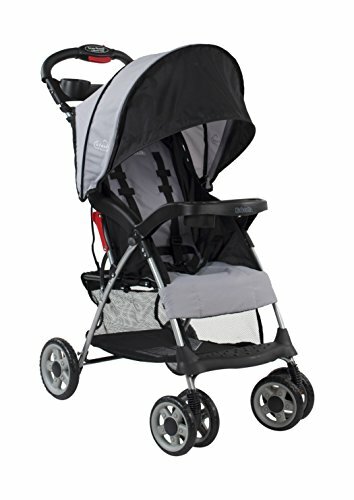 But other than that, it’s a damn good stroller – the seat reclines, the canopy is adjustable, the harness has 5 safety points and the suspension on it is pretty good. Additionally, it’s pretty easy to store since it folds very nicely and becomes really compact. One thing I really like about this particular stroller is the design of storage space for parents – it is not just a plain open basket that displays all your things to the world. Rather, the basket has a zip cover as well as a rear pocket and two additional compartments, that still allow you to have some privacy. Overall, it is certainly a great choice for an older choice, but only if you can afford the high price tag. The bersey Kids stroller tricycle is pretty similar to the previous one we talked about. But, it is more expensive than it, and in turn it has quite a few more features. For one thing, this is a 7-in-1 trike, as opposed to the previous 4-in-1. It also has foldable pedals, an armrest, an adjustable backseat, double brakes and even a closed storage basket for the parents. And even the seat can be rotated, so that you can turn your child to face you if you want to. Pretty, awesome, right? But there is a catch – those 110 lbs are just a reference to the weight that the trike can hold. Keep in mind that there are full-grown adults who weigh this much, and there’s no chance they would be able to fit inside this stroller! The thing is, older children are meant to use this as a trike and not a stroller. A 40-lb child might not fit perfectly inside the seat with the harness, and you will have to remove it for them to be able to use it. Which means no safety options whatsoever. But if your kid is big enough that you don’t need to worry about them falling off the trike, then great! Maybe you want to use it a stroller with your younger child, and as a trike with the older one – even better! Because, even when you turn this into just a trike, it’s your choice whether or not to remove the handle bar. So, you will still have some control over your kid, as opposed to getting them a regular trike. The Graco Tandem is a stroller for two children, similar to the Joovy Caboose. It has a reclining seat that is compatible with a car seat in the front, and a back seat that allows your kid to either sit or stand. But, if you have a car seat in the front of the stroller, your kid won’t be able to sit on the back seat, because there is not enough space. And that’s just poor design, if you ask me. Other than that, it’s a pretty good stroller. It has a larger maximum weight capacity than the previous stroller of this type that we talked about, and so it is an even better fit for older children. The front seat can be fully reclined to lie flat, and the back seat is completely padded and your kids will feel comfortable sitting on it. 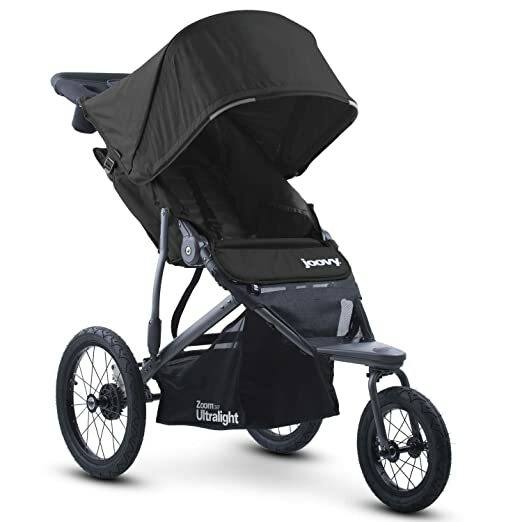 And the stroller is equipped with lockable front swivel wheels, that allow for easy maneuverability. There are cup holders and trays for both the kids and the parents, which is pretty convenient. Additionally, the storage basket under the seat is pretty large and will fit most of your on-the-go must haves. Overall, I would say that this stroller is a great choice for parents who have two kids with an age difference of 1-2 years. It will make running errands with them much easier and quicker. 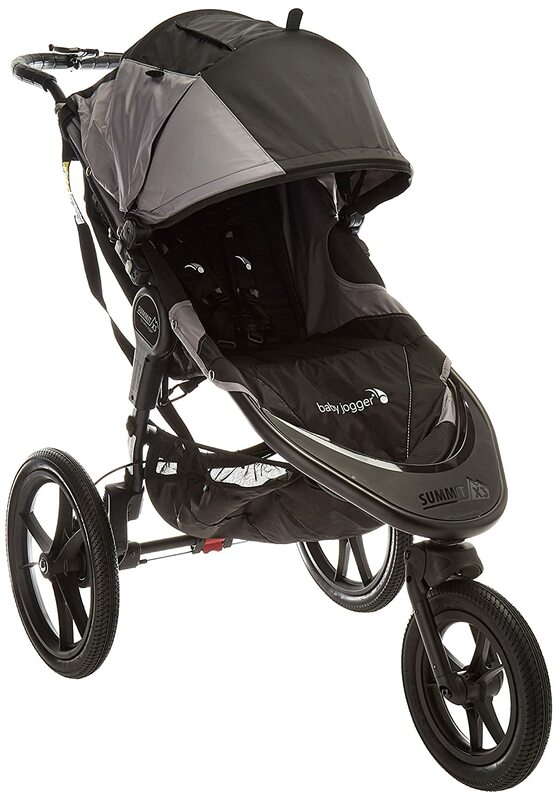 The last but definitely not the least stroller we’ll check out is the Baby Jogger Summit X3. 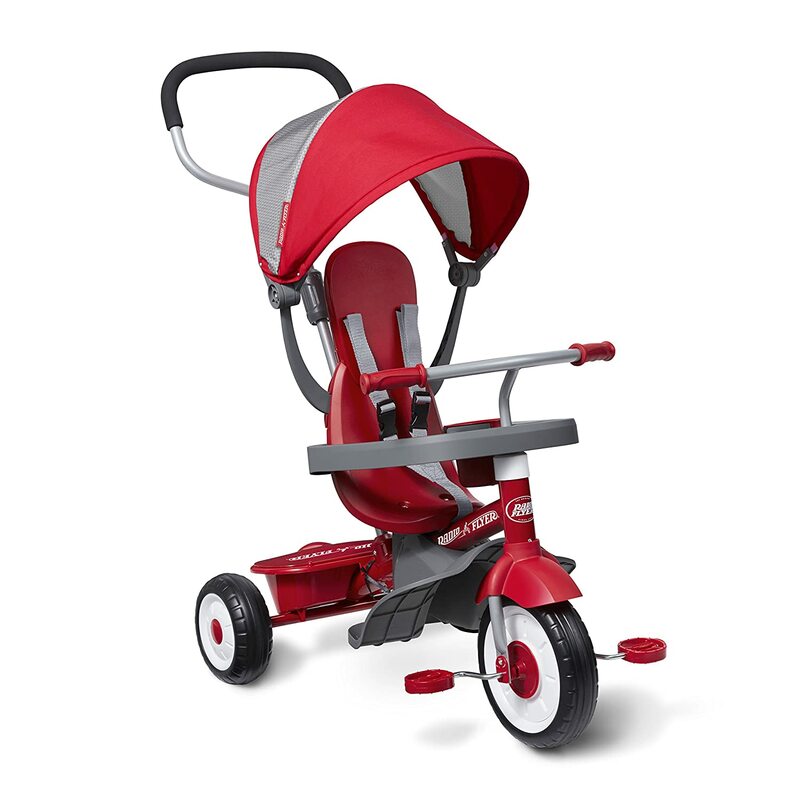 It is an all-terrain stroller, with large wheels that offer great shock absorption. So, it’s actually a good choice for parents who are looking to step off the beaten path with their kids. The wheels are pretty sturdy and they swivel, for great maneuverability around the town. And the lock for them is mounted on the handle bar, which is really convenient. This stroller is very easy to fold and unfold with a simple pull of a strap, which means it’s super convenient to store almost anywhere. And which makes it the perfect stroller to take in your car everywhere! But one downside of this stroller is that the storage basket under the seat is pretty small, and you will probably need to bring an additional bag. There’s one more thing to note; this stroller is not the best choice if you live in a really warm area. 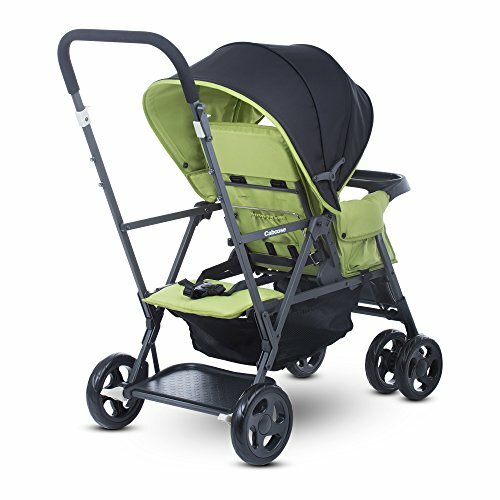 It gets hot inside the stroller, and your kid probably won’t like that. But, as far as your own comfort goes, you will find that the height of the handle is a good fit for most people, and that a painful back will be a thing of the past. Overall it’s a pretty good choice if you looking for an off-road type of stroller. It’s actually hard to say point blank what your best options are, without knowing exactly what you are looking for in a stroller. But I promise I will do my best. 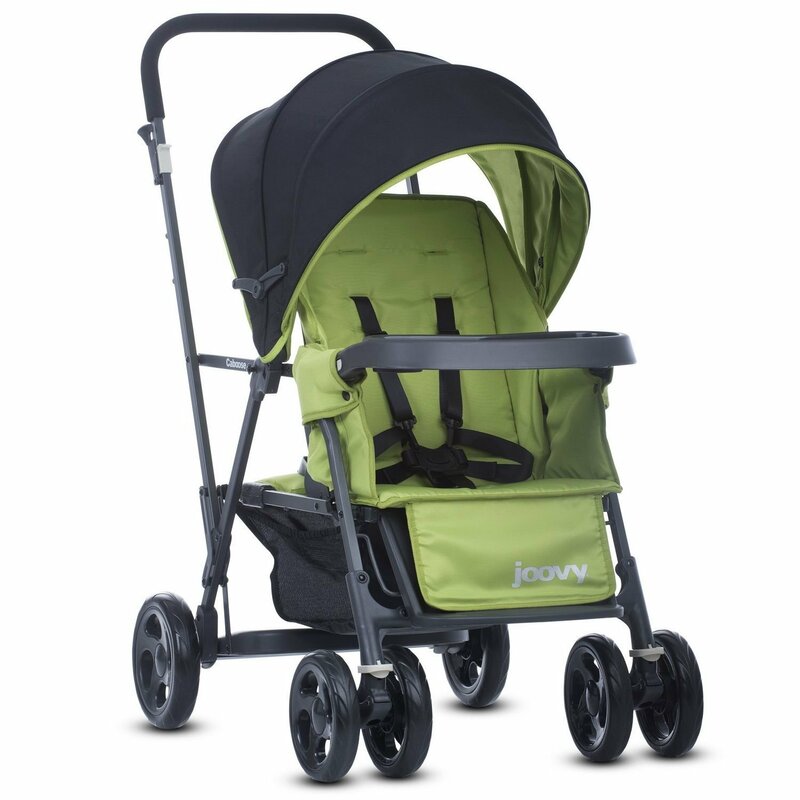 The overall best choice and value for money is the Joovy Zoom Jogger Stroller. It has a large maximum weight capacity, which is without a doubt suitable for your older kids, as well as a pretty tall seat. It’s comfortable, well-designed, and has all the necessities to make life easier for both you and your child. And all of that at an affordable price tag! In terms of the more high-end strollers, I would definitely recommend the BOB Revolution Jogger Stroller. BOB is simply a brand that moms trust and that they always return to, and for a good reason. Their products don’t disappoint, and they will last you for years, if not decades to come. The stroller in question is large, has a maximum weight capacity of 75 lbs, and locking swivel wheels. Oh, and it is one of a few strollers that actually allows you to adjust the height of the handle bar, which you will definitely need if there’s a large height difference between you and the spouse. And finally, I would recommend the Graco Room for 2 Tandem Stroller for parents who have two kids close in age. This is a great choice because it allows you to put the smaller child in the front seat (which is also suitable for your older child), and have your older kid in the back with you. What’s really great about this is that the big kid can choose whether to sit or stand in the stroller, which actually gives them some sense of authority and independence. And that’s pretty cool if you ask me. This is it for now. 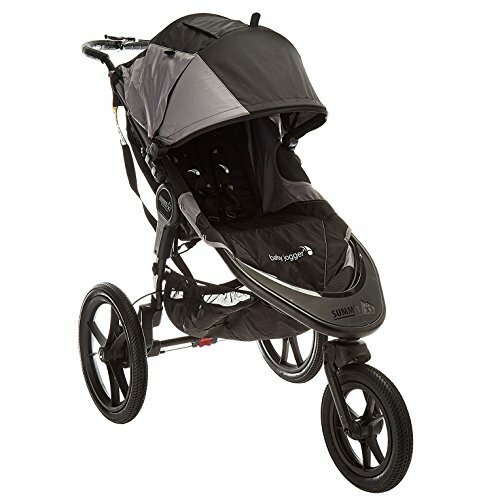 All of the strollers are available on Amazon, and you can check out their prices there. Be sure to do that, because you never know just how good a deal you can stumble upon!